The 2014 model year Nissan Leaf (US version) will see a few modest changes, based on preliminary details announced today by Nissan. 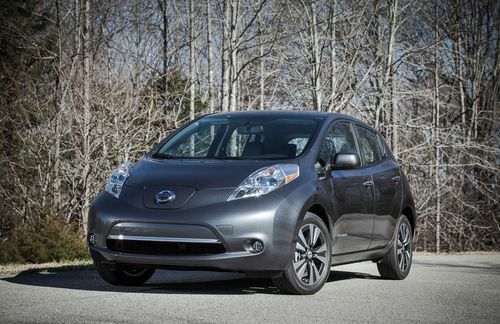 The major change for the Leaf over the last year was moving production to the U.S., for the 2013 model year Leaf. Today's announcement puts the Leaf on a more equal footing with Nissan's other cars, because the details came with their yearly package of product changes, and availability of the 2014 Leaf comes in October 2013 just like Nissan's other cars. While the changes in the 2014 Leaf are modest, it represents a milestone of normalizing the Leaf as just another car in Nissan's product family. Is this a step towards the electric car becoming mainstream? In the 2013 model year Leaf a big change was the shift to three models, the entry-level priced S, and the SV and SL models offering more features at a higher price. This same arrangement is continuing with the 2014 model year, though the S is getting some upgrades. However, Nissan hasn't released prices for the models so we do not know whether the $28,800 entry level MSRP of the Leaf S will continue into 2014. That entry level price has proven challenging for the other automakers, who have responded with price cuts of their own. The RearView Monitor, formerly an option on the S and standard on the SV and SL, is now standard on all models. This feature is a rearward facing camera and display on the dashboard. This was previously part of the 6.6 kilowatt charging option on the S.
EV-IT (information technology) improvements include voice recognition for entering destinations into the navigation system, and voice readout of SMS messages. The power train and battery pack will remain the same in 2014 as it has since the cars launch in late 2010. Nissan describes the driving range as "EPA-estimated range of 73 miles at a 90 percent charge; customers who fully charge may get up to 84 miles of range". The Nissan Leaf is Nissan's entry into the electric car market. With the Leaf they're established as the leader in electric vehicles, by selling over 25,000 units in the U.S. and 62,000 units worldwide, by May 2013. It is designed to be a typical family sedan, roughly similar to the Nissan Versa. For info on the 2013 Leaf see 2013 US Leaf has improved range, charging speed, and lower price. As near as we can tell, most of that information is still valid for the 2014 model.